I am deeply convinced that this whole issue about Shilla was triggered by the very first flag we encountered. We drove on the M1 heading for Soccer City, two hours before the whistle for the start of the play. 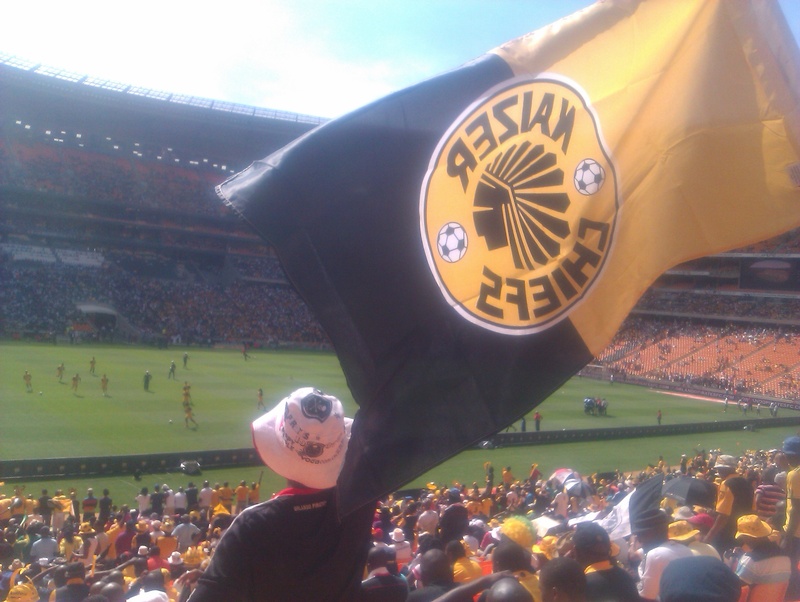 A Mercedes overtook, with a Kaizer Chiefs flag waving from the back. “That’s the ensign of one of the two teams we will watch playing just now” I pointed at the yellow-blackish fabric that had printed on something that reminded me of a head of a pharaoh. Shilla’s ten years old eyes glanced as she nodded. While approaching the stadium next to Soweto also did we see flags of Orlando Pirates, the opposing team. But Shilla hardly cared, her thoughts were somewhere else. 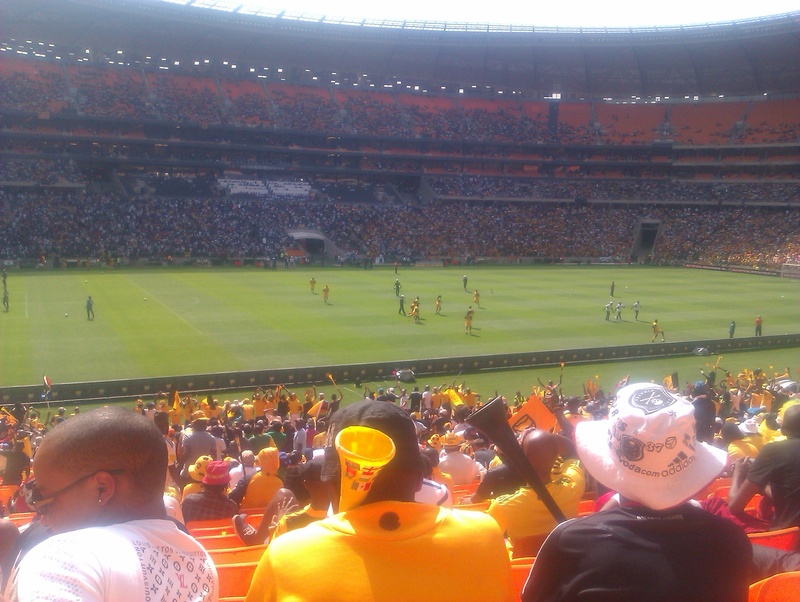 Close by sat only two Orlando Pirates fans in black and white, the rest of our neighbors were dressed in yellow. Even if she had not properly noticed what had happened on the field, Shilla screamed, she perfectly imitated our neighbors reactions. It was an own goal, One:Nil for Amakosi, the Chiefs. Till that moment the Pirates had been doing much better, it was the Chief’s first attack. The two Pirates fans close by snipped their fingers: “Just wait” they shouted to the crowd around, a glimpse of arrogance in their voice, “just wait”. Shilla decided to focus on these two Orlando fans, she even stood on her seat to be able to observe their really creepy faces. At that stage she missed to follow the game. When ordering the tickets my only concern was to be seated in the shade. As it goes, we were sitting directly in the cruel sunshine. It felt like my brain being cooked. But Shilla would not keep her cap on, she said it was disturbing. The cap was dark blue, close to the color of the Pirates’ jerseys. She chose the yellow ice, and she said she enjoyed it. The ice melt in our hands. I did not understand why the referee decided on penalty. I lifted Shilla so she could see the shot. The ball hit the back of the net. Shilla blew the vuvuzela like hell, the Kaizer Chiefs fans in the stadium started to jump up synchronously, Shilla being part of. The whole arena was shaking. “That’s what it might have felt shortly before the walls of Jericho came tumbling down” I mumbled to myself. I stood still, alike the two Orlando fans. 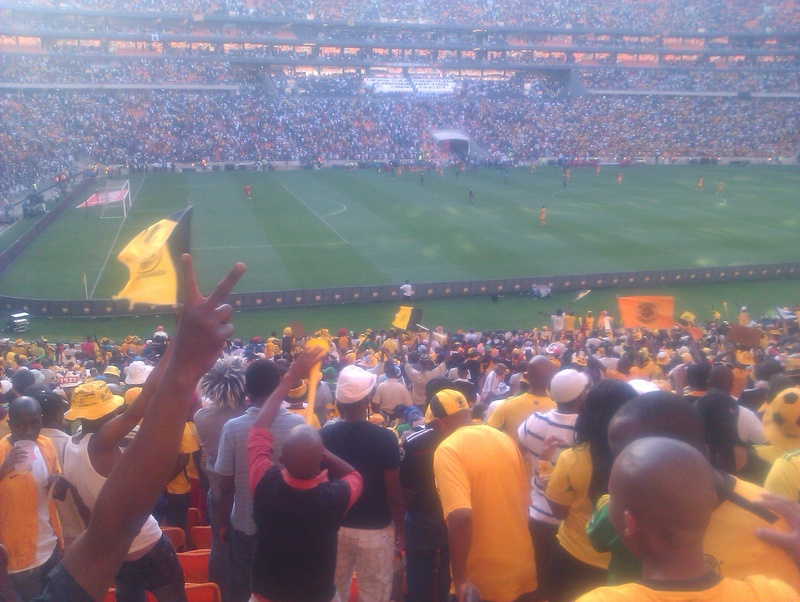 They were laughed at in despise, sweat running all over the heated faces of the celebrating Amakhosi fans. The Three:One was the first nicely played goal. But not even the two Orlando fans cared. Although there were 10 minutes left to play one of Pirates supporters mechanically gave congrats to his neighbors and then disappeared – or did he just evaporate? The second Orlando fan tried to fix his vuvuzela. Shilla would not stop to focus this one from time to time while she endlessly clapped her sweaty hands. Five minutes to go the sun finally had gone down deep enough, we were comforted with shadow. Everybody around took a deep breath: the best moment of the whole game. The shade even cooled away the doggedness in the eyes of the Chief’s fan that spat at me. I smiled and he waved back and even gave me a thumbs-up, pointing at Shilla with his eyes. “When is the next game of the Chiefs?” was the first question Shilla asked after the final whistle. This day Shilla became a relentless Kaizer Chiefs fan. I still would explain that with the first flag we encountered on our way to the stadium. This must have triggered her support for the Kaizer Chiefs. Behutsam dreht der Junge seinen Kopf, seine Hände krallen sich in den Sand. Augen und Ohren wirken, als saugten sie sich an seiner Umgebung fest. Alle Menschen um ihn herum starren zum Großbildschirm, dort wird das Weltmeisterschaftsspiel übertragen. Vor ihm stehen sie, verdecken ihm den Blick zur Leinwand. Er sieht nichts als Rücken. Der Junge sitzt, im Sand, am Strand, gespannt. Head turning slowly, fingers clutching at the sand. This boy is very carefully observing his environment. The surrounding people stare at the huge screen where the Championship game is shown. The boy can see nothing but backs because the people are standing in front of him. Thus this boy sits in the sand, on the beach, in tense. Hier ist noch nicht alles fertig, die Bühne, die Leinwand, der Projektor. Auch für die Verkaufsstände wird noch das Dach gedeckt. Aber man ist optimistisch, bis nächstes Wochenende, spätestens übernächstes, also zum Finale wird der kleine Fanpark stehen, sehr wahrscheinlich. Aber das heisst ja nicht, dass man unglücklich oder niedergeschlagen sein muss. Man muss eben damit klar kommen, wenn die Fussballweltmeisterschaft auf einmal, jäh und unvermittelt startet. Und auch wenn die Weltmeisterschaft in einem Monat jäh und unvermittelt enden wird, auch dann wird es ein Lächeln geben und der Mann mit der Vuvuzela wird dazu pusten. Yes, our small fan park is not yet built up like planned. But don’t worry. Everything will work out, at the end. At the very end. 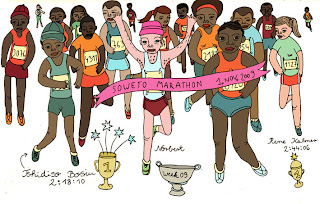 Just take a look at me, I am the man who has got nothing but a smile and a vuvuzela to blow.